There are so many different aspects to this year’s Breeders’ Cup Classic and so many little tidbits surrounding the participants, it is time to share some of them. So, we now present, “Everything you always wanted to know about the 2014 Breeders’ Cup Classic but were afraid to ask.” No need to be afraid. That’s what we’re here for – to enlighten and confuse and to tell you more about the Classic than you care to know. When European invader Toast of New York arrived at Santa Anita the other day, he increased his total miles traveled to an amazing 31,000 in the past eight months. Making three transatlantic trips to the United States in one year is pretty extraordinary, but for two of them to be all the way to California makes Toast of New York the toast of two continents. And this is a horse who had traveled from England to Dubai and back earlier this year. Cigar Street, winner of the Homecoming Classic, made his debut 33 months ago. He has spent 25 of those months on the sidelines recovering from injuries. So, in actuality, his racing career, which began back in Feb. of 2012, has spanned a total of five months. 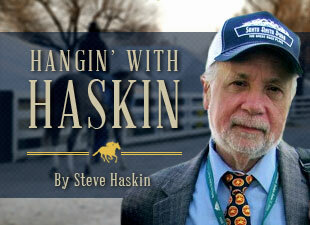 What do trainers Steve Margolis, Eoin Harty, Paul McGee, Steve Asmussen, Bob Baffert, and Jedd Josephson have in common? They all are former trainers of Breeders’ Cup Classic starters. Margolis trained Cigar Street. Harty trained Imperative, McGee trained Majestic Harbor, Asmussen and Baffert both trained Prayer For Relief, and Josephson trained a horse by the name of Shared Belief. Earlier in the year, Gary Stevens was high on two of his regular mounts on the Kentucky Derby trail – Bayern and Candy Boy. Stevens did ride Candy Boy in the Derby and almost went down from an incident of the first turn, and rode Bayern to a third-place finish in the Arkansas Derby. A month after romping in the Woody Stephens Stakes aboard Bayern, Stevens was forced to leave the track again to undergo knee replacement surgery. Somehow he made it back in time to ride a couple of horses in the Breeders’ Cup, but will have to watch his old Derby trail horses competing in the Breeders’ Cup Classic. Both horses and Stevens have a come a long way since then. It will be a bittersweet Classic for trainers Eoin Harty and Bill Mott. Harty will saddle Godolphin’s Footbridge, whose sire Street Cry, Harty’s first big horse of his career, died recently. Mott will saddle Cigar Street, whose “uncle,” Cigar, who Mott trained to a Hall of Fame career, also died recently. If Bob Baffert feels badly about his 0-for12 record in the Classic, he might feel a little better knowing that he and superstar trainers Todd Pletcher, Nick Zito, Shug McGaughey, and Aidan O’Brien are a combined 0-for-58 in the Classic. So he’s in good company. Here are some thoughts to ponder about several of the Classic horses. If you want to weigh the negative and positive regarding Moreno, he is 0-for-6 at Santa Anita and is 0-for-8 in fields of 10 or more. But his sire Ghostzapper and both his grandsires, Awesome Again and A.P. Indy, all won the Breeders’ Cup Classic. So if there is a horse bred to win this race, it is Moreno. Tonalist is 3-for-3 at Belmont Park and 1-for-5 at other tracks. And 13 of Zivo’s first 14 races were against New York-breds. After only three races in open company he is a leading contender for the Breeders’ Cup Classic. Although he likely will be on the also-eligible list when entries are drawn later today, it is interesting to note that Argentine-bred Big Cazanova was ranked the No. 2 grass horse in Argentina despite being a maiden. The son of Giant’s Causeway finished second three times, once on the grass in a grade I stakes, to the top-class Indy Point, who made a big name for himself in America. And how did Big Cazanova manage to still be a maiden when he came to the U.S., despite finishing first in the grade I Clasico Jockey Club Del Peru? He was disqualified from first in that race, not for anything he did, but for an infraction by his stablemate, which resulted in him getting disqualified for guilt by association. Ponder this: The two marquee names in the Breeders’ Cup Classic – Shared Belief and California Chrome – respectively did all their serious training at Golden Gate Fields on the Tapeta surface and Los Alamitos, which is mainly a Quarter Horse track. You don’t see that very often. And you can add Toast of New York, who comes to California from his home base at Lambourn in England. Corey Nakatani, who has the mount on Candy Boy, has had the distinction of riding both Shared Belief and California Chrome. Remember Danza, who burst on the Derby scene with a brilliant victory in the Arkansas Derby? Well, he just happens to be a half-brother to Majestic Harbor, both bred by Liberation Farm and Brandywine Farm. Finally, if you want to stick it to the establishment, box a trifecta of California Chome, Toast of New York, and Zivo. Wouldn’t the breeding industry just love the first three finishers of the Breeders’ Cup Classic sired by “big-name” stallions Lucky Pulpit, Thewayyouare, and True Direction. If you want to take it one step farther, you can have a saver trifecta box on California Chrome, Prayer For Relief, and Toast of New York. This way you get three horses whose broodmare sires are Not For Love, Mr. Sparkles, and Syncline.